“Nooooooo!” says Reed, age five, in response to his dad’s usual joke about the menu at molly moon's. But it’s not the (make believe) presence of alligator ice cream that bothers Reed so much: it’s the idea that there could ever be an absence of his favorite flavor: melted chocolate. Reed has been visiting our Madrona shop since he was two years old, and there’s a good chance he’s melted chocolate’s biggest fan … ever. “I don’t think he believes we should carry anything but chocolate ice cream,” says Sky, our Madrona shop manager who has been scooping chocolate ice cream for Reed for almost three years. Our melted chocolate ice cream is made with 70% dark Theo chocolate. To get just the right dense texture and rich flavor, our ice cream makers heat up milk and cream and then pour it over the chocolate. (We use a whopping four pounds of chocolate per batch.) As the chocolate melts, it makes a rich ganache that we combine with cream, milk, sugar and organic vanilla bean to make our chocolate ice cream. This is exactly the right amount of chocolate for Reed, also known to our Madrona shop crew as “Chocolate Boy.” According to Reed’s mom, he loves very chocolatey things and has been known to reject things like chocolate graham crackers and other (non-MM’s) chocolate ice creams on the grounds that they do not contain enough chocolate. Reed and Sky have become buddies during his frequent visits to the shop. After he gets his ice cream – usually a kid’s scoop of melted chocolate with sprinkles in waffle cone – Reed will pull up a stool hang out with Sky, chatting away, his face covered in chocolate. If another customer needs to get to the counter, he moves the stool to make room for them … and then moves it right back when they leave. Editor's Note: This is the first in a series featuring our favorite VIPs (Very Ice creamy People!) If you'd like to nominate someone - or yourself! 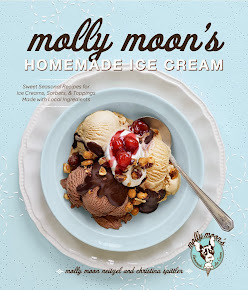 - for this honor, drop us a line at info@mollymoon.com.